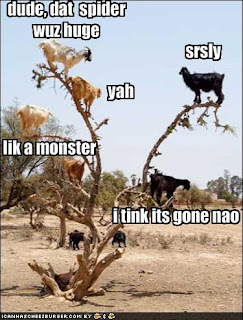 I was blog hoppin’ as usual and came across this really funny site that has all these funny cat and other animal pictures on it and today’s was so appropriate, because I would be on top of the tree with those animals as I have a major arachnophobia…..yikes……. I am working on my latest layout I started last weekend, and hope to post it tonight. And I hope to make a card that will sort of go with it, as it is matching the papers I am using, which is the MM Passport line. I love these papers, and apparently Ching and Kari loved it so much, too, that they had to run out Sunday morning and buy it as well. I will hope to post my layout either tonight, or tomorrow.